Compact Kleer transmitter links iPods to high-end Sennheiser wireless phones | What Hi-Fi? 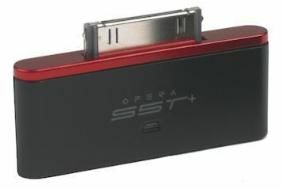 The £49.95 Opera S5T+ uses the Kleer wireless system, and unlike the standard home-use base-stations, is both very compact and powered from the device to which it's connected, using the standard multipin Apple connector. With a transmission range of up to 10m indoors, the transmitter offers full-bandwidth CD quality and ultra-low latency to avoid lip-synch delays when watching video, and will work with Sennheiser's RS160, RS170 and R180 headphones. It also works with all other Kleer devices, including headphones from TDK, Sleek and Opera, as well as the Arcam rCube and rDACw, and can feed up to four devices at once. Pairing is a one-time operation, after which the transmitter will automatically connect to the paired devices.